Saturday morning in Venice dawned sunny and inviting. After a leisurely breakfast in our little kitchen, we set off to explore the city. We found a gondola waiting for us right outside our apartment door! Just joking. Gondola rides cost 80-100 euro (US$110-140) a ride. We'll save our gondola experience for another time. We found the local hospital in a nearby piazza. So this is where I might work as a nurse if we lived in Venice? And spoke fluent Italian? And were Venetian? Venetian tourist shops are filled with papier-mâché Carnival masks. And, occasionally, cute dogs. We found a lovely bookstore with the self-appointed status of "the most beautiful bookstore in the world." 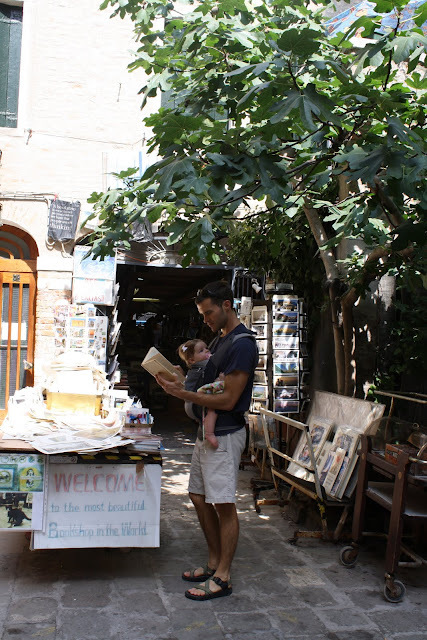 We bought vintage Venetian postcards for our family here. 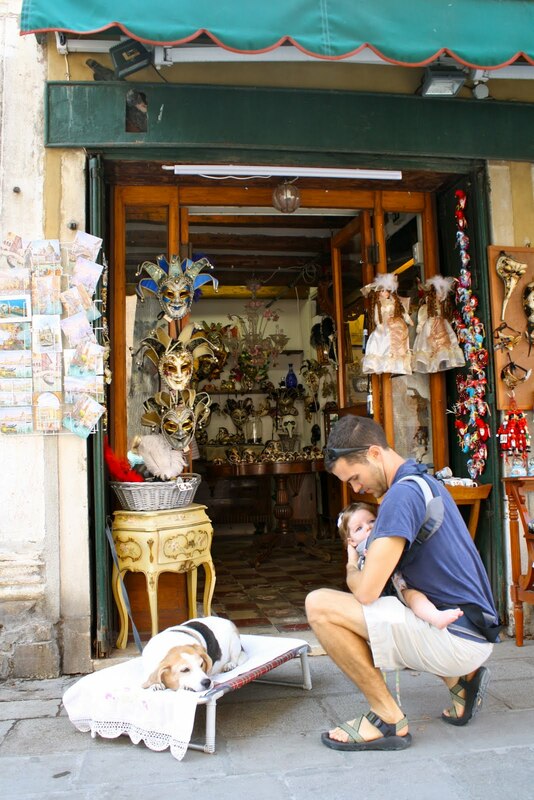 A common sight in Venice. The pink wine bottles on ice are Bellini, a local drink made from prosecco and peach juice. Mmmm! A close-up of the Doge's (duke's) Palace, back from the days when Venice was a dukedom. Do you remember studying the salmon-colored building in architecture in 8th grade, siblings? Finally I've seen it myself. 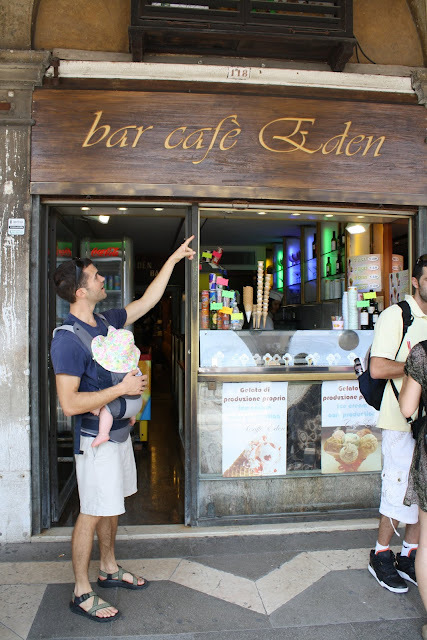 The perimeter of St. Mark's Square is lined with cafes. We took this photo for you, Eden. The famous pigeons of St. Mark's Square. A lace shop along the Square. My mom owns a strawberry-embroidered linen set just like this one. At the end of the square we caught this couple kissing on the pier. It was such a good shot that I walked up to them after their kiss and offered to take a picture for them. And then they returned the favor! 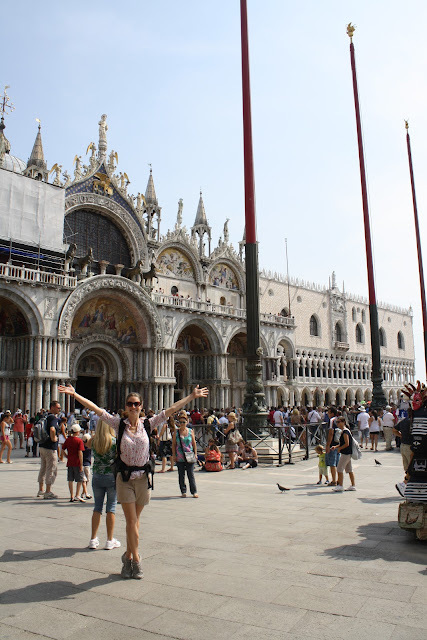 We walked on along the southern edge of Venice away from St. Mark's Square and towards a public garden. According to Rick Steve's, this is the only place in Venice where picnics are allowed. So, of course, we picnicked on our packed lunch. And gave Lena a welcome break from the baby carrier. And then onward. The Chiesa (church) di Santa Maria della Salute is in the background here. It's across the Grand Canal on a separate island entirely. Venice itself is built on thousands of little islands, and the water is so shallow that you could walk from island to island through the water without getting your hair wet. 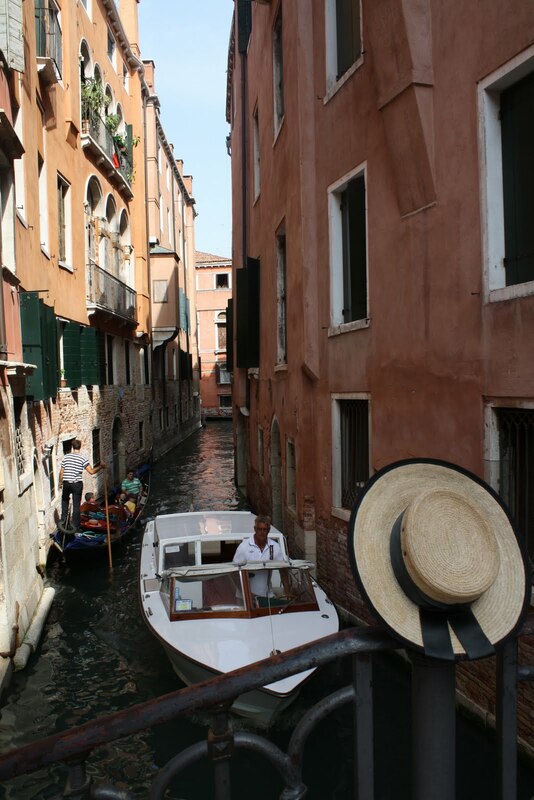 Hence Venetians have their traditionally flat-bottomed gondolas. Nowadays the canals are often deeper to allow for heavier water traffic. Outside Harry's Bar, once a hangout for characters like Ernest Hemingway, we spotted an excited crowd around some Italian film celebrities. They were total hams, posing for photographs. One of the water taxis is about to pass under the bridge. These gleaming wooden motorboats are so 1940s in their appearance that I expected to see Grace Kelly sitting in one of them. Meanwhile, a forgetful gondolier left his straw hat on the railing. And here's the whole art display. 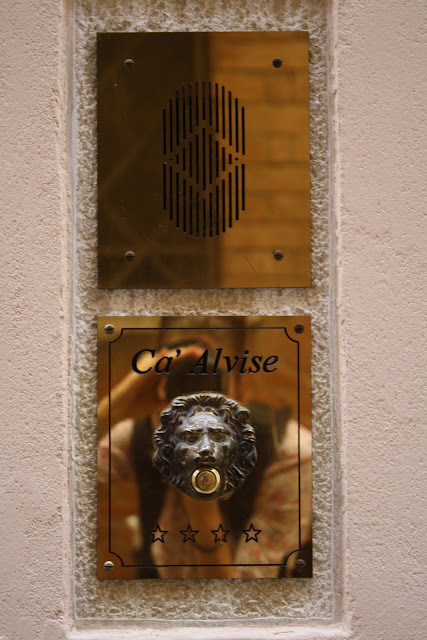 Lions are the symbol of Venice. I found hundreds of lions on door knockers and doorbells all over the city. 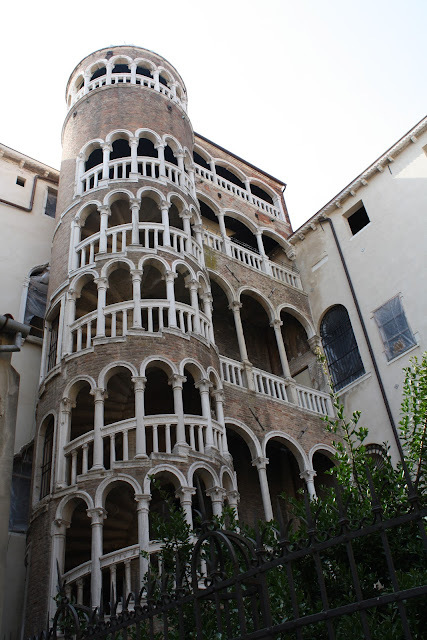 The Scala Contarini del Bovolo, which has magnificent views from the courtyard at the top of the staircase. Unfortunately we didn't see these views because the scala was closed for construction. Boo. ... and out to the Grand Canal, with the famous Rialto Bridge in sight. The bridge was a cacophony of tourists and overstuffed shops. The view from the bridge, however, was reward enough for being jostled and over-stimulated. The crumbling, watery, romantic Venice in all her glory. We stepped off the bridge into the quiet back alleys of Venice to find the fish market for our supper supplies. Along the way we spotted a bride and groom! This was not the first wedding we found in Venice. One wedding procession we came across was entirely American. Quite the destination wedding. After dinner we took a nighttime walk through the streets and back to magical St. Mark's Square. But I'll save those for tomorrow. I love your stories told with pictures! Thanks for posting on FB so I can be reminded to take a look. wait the kissing pictures exchange thing is SO FUNNY. the painted wood eggs thing is so cool! I can't imagine how long that must take her. and where do you even get inspired to do something like that? like where does that idea even come from? 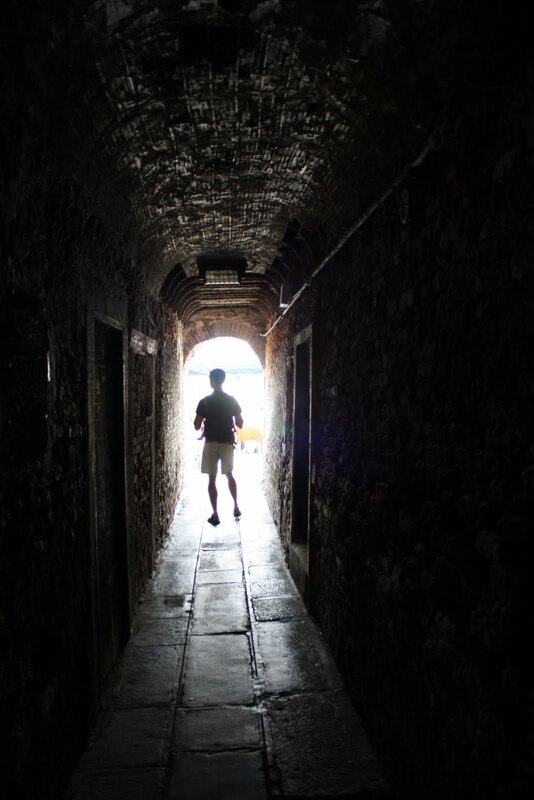 also the picture of elliott walking down the dark passage thing is really cool. i like. Autumn Chicago likes this.